During the Zillertal RocTrip this summer, I had a chat with Chris Sharma about the routes at the Schleierwasserfall. I also asked him about Open air, Alexander Huber's, at the time unrepeated 9a+. Chris said that he had tried it briefly, but wasn't really attracted by it. He also said that he had doubts regarding its current status, and said that he thought one or more holds must be missing, as there was a section that he couldn't even imagine the moves on. 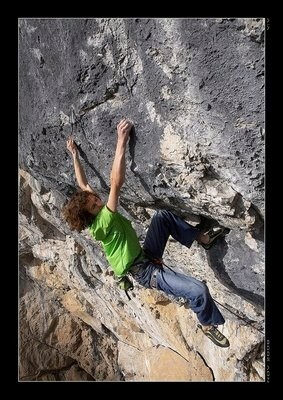 It should be said, Chris tried the route in the summer, when the conditions were far from ideal. I mentioned this to Alexander, who commented: "Climbers like Chris Sharma are used to climb the modern soft-grade 9a-routes within in a day, investing no more than three or four attempts. For climbing Open Air or any other hard old-school-route they have to invest a little bit more than just a few attempts. Surely today?s top climbers are stronger than Güllich, Moon or I had been in those days ? but for a repetition of the old-school-top-routes they have to work harder than for so many other modern soft-grade routes, which then even carry a higher grade!"